1-2 September 2012 Borodino, Russia 200 years of The Battle of Borodino. 22-24 June 2012 Kaunas, Lithuania 200 years after the enemy crossing Neman near Kovno. Start of the war. Photos on forum. 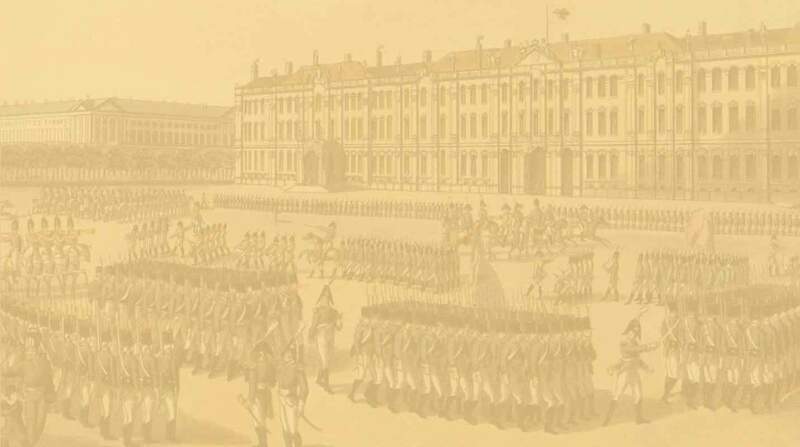 21 April 2012 Gatchina, Russia Guards set out from Gatchina Palace. Commencement of 1812 campaign. Photos on forum. 21-23 May 2010 Yanino, Russia Impressive two days long tactical wargame in woodland. Photos on forum. 21 February, 2008 Ahvenkoski & Lovisa, Finland 200th anniversary of start of Russo-Swedish war 1808-1809, see photos. 01-02 September, 2007 Borodino, Russia 195th Borodino anniversary. 18-19 May, 2007 Yanino, St. Petersburg, Russia Tacticals. 10-11 February, 2007 Bagrationovsk, Russia 200th anniversary of Preussisch-Eylau. 2-3 September 2006 Borodino, Russia 194th Borodino anniversary. 19 August, 2006 Gatchina, Russia Traditional Day of the Guards commemorated with manuevres in Gatchina. 20 May, 2006 St.Petersburg Multi-period festival "The Seven Epochs" on the ground nearby the Artillery Museum. 3-4 December 2005 Slavko-u-Brna, Czechia 200th anniversary of Austerlitz. Photos. 3-4 September 2005 Borodino, Russia 193rd Borodino anniversary. Photos. 02 July, 2005 Gatchina, Russia Skirmish & tactical manuevres in Gatchina, see photos. March & June 2005 St.Petersburg We took part in shooting of two films, see some photos. 3-4 September 2004 Borodino, Russia Another (192th) Borodino. Very good reenactment. Photos. 5-7 September 2003 Borodino, Moscow region, Russia 191st anniversary of Borodino!!! Continuous rain and deep mud didn't spoil our joy of meeting friends and taking part in a very nice reenactment. Take a look at our photo-report in two parts: Peter's Brigade at Borodino-2003. 23 August 2003 Gatchina, Russia Regimental Holiday and 190th anniversary of battle of Kulm were celebrated at a small reenactment in the countryside. See our photo-report. 19 August 2003 St.Petersburg Together with Semenovsky Life Guards being Peter's Brigade, we now share domain www.petrobrigada.ru. Our site will be migrating from geocities.com soon. 12 June 2003 Lomonosov, St.Petersburg region, Russia Our unit presented a performance in front of mid-18th century palace in Oranienbaum, one of Imperial residences around St.Petersburg. Visitors watched our drill excercises and could learn about historical uniforms. Photo. 27 May 2003 St.Petersburg, Russia On the day of 300 anniversary of St.Petersburg we participated in "abordage" - boarding historical sailing ship amid Neva river. It was a unique reenactment of an episode of Great Northern War, when two Swedish vessels were taken by boarding by guardsmen led by Peter I. See report and photos from this one of most exciting reenactment. We very appreciate cooperation of enthusiasts from historical frigate "Shtandart". 24 May 2003 St.Petersburg, Russia We took part in a performance at spot on old Swedish fortress Nienschanz, taken by Tsar Peter in May 1703. This was our ever first event in the new early 18th c. garb. See photos here. More events connected to 300 anniversary of St.Petersburg coming! 07 May 2003 St.Petersburg, Russia Soldiers of Tsar Peter the First! Now we re-create uniforms of the regiment of early 18th c. We got our uniform kits for 1709-1712 period, see first pictures here and here. Looking forward meeting colleagues and attending events in this amazing historical period. 05 April 2003 St.Petersburg & Moscow, Russia Two great news to our unit. First, we have renewed cooperation with State Memorial Museum of A.V.Suvorov. And the last not the least, our brother-unit Semenovsky Life Guards has been raised in Moscow. Together we form "Peter's Brigade", the two eldest regiments of the Guards created by Tsar Peter I. 19-20 October 2002 Maloyaroslavets, Kaluga Region, Russia The 190th anniversary of the battle of Maloyaroslavets, the turning point of Napoleon's invasion! It was splendid event, despite Russian troops were toughly outnumbered by Great Army. The "Peter's brigade" once again proved to be the best. See photos from the battle here. 7-8 September 2002 Borodino, Moscow Region, Russia Borodino's 190th anniversary! This time even greater event than before. We fielded "Peter's brigade" - two oldest Guard regiments - Preobrazhensky and Semenovsky Life Guards. Here are most impressive photos from the event; and here - couple pictures of us crossing the field and us marching to the sound of guns. 27-28 August 2002 Savitaipale, Finland As a part of Saimaa Music&Art Festival we have visited old fortress Kärnäkoski, which was built in 1793 by A.Suvorov. See us in the fortress on this photo. 7-9 June 2002 Kaunas, Lithuania The 190th anniversary of Napoleon's passage of Niemen river - outbreak of the invasion and the Russian Campaign of 1812. International military historical festival, with participation of Preobrazhensky Life Guards. See photos from Lithuania. 25-26 May 2002 Borodino, Moscow Region, Russia Historical festival for children, "The Steadfast Tin Soldier". Members of our and other friendly regiments took part in the reenactment. 25 May 2002 St.Petersburg, Russia Preobrazhensky reenactors took part in celebrating St.Petersburg's 299th anniversary. 18-19 May 2002 Mozhaisk, Moscow Region, Russia Another tacticals near Mozhaisk and Borodino. Our non-combatant took part in this event and experienced tough night march, cold rain, chilling wind, bitter of defeat and delights of victory. See photo of a Russian army detachment. 9 February 2002 Bagrationovsk, Russia The 195th anniversary of battle of Preussisch-Eylau (nowadays Bagrationovsk). We traveled there and took part in the reenactment on the historical battlefield. See photos from the reenactment. 9 December 2001 Gatchina, Russia Another winter reenactment - Austerlitz. The event was great: fine weather (well, at least for us), much action and plenty of fun before, during and after the battle. See the wonderful photo-report by our non-combatant. The event in the old Russian North-West fortress Karela (in 17th-19th centuries - Kexholm). Small stone fortress is pretty good for reenacting various periods of our history. On the photo you may see Preobrazhensky repulsing an attack at the fortress. 15-16 September 2001 Oravais, Finland Reenacting the battle of Oravais, Sept. 1808, of Russo-Swedish war 1808-09. Participating in picture-taking of a film about the battle. Photos: Russians, Swedes, Russians and Swedes. Moscow Region, Russia 189th anniversary of Borodino battle. Traditional 3 days long histoirical bivouac, meeting friends-reenactors from all over Russia, visiting Guards officers' graves on the field and, of course, the reenactment itself. See detailed photo report by our non-combatant Oleg Polyakov at "1812"; and here, take a look at few our photos: color-bearier and drummer near the tombs, Preobrazhensky in reserve, grenadier battalion loading. 17-28 July 2001 Boulogne-sur-Mer, France Preobrazhensky reenactors participated in the international reenactment festival on a place of famous Napoleon's Boulogne camp of 1804. 30 June - 1 July 2001 Mozhaisk, Moscow Region, Russia Two-days long tacticals were held near Mozhaisk and Borodino with participation of about 80 foot and mounted reenactors. It were manouevres and marches in full equipement under extreme heat, continious skirmishes and major fights and bivouac on open air through two days, which made us feel the era better and respect soldiers of those times more. A single Preobrazhensky grenadier managed to take part in this brilliant event and you can see his his photo-report. 27 May 2001 St.Petersburg, Russia Preobrazhensky reenactors took part in celebrating St.Petersburg's 298th anniversary. We lead in the parade along city's main street - Nevsky Prospekt. Czech Republic The 195th annivercary of the battle of Austerlitz. Members of Preobrazhensky regiment, first dressed in Austerlitz-pattern uniforms, visited the historical battlefield again. Shoulder to shoulder with our brothers in arms - Czech reenactors of Russian army - we faught bravely and were to retreat according to scenario only. The detailed report on this campaign is available in Russian only. Moscow Region, Russia 188th anniversary of the battle of Borodino. This year it was the largest reenactment ever held in Russia. Our unit went out in it's best shape: better than ever equipped and in full strength. For more details about the event see our own photo report and a photo report of the Project "1812"
Russia Regimental holyday is celebrated in Transfiguration day in Russian Orthodox religious tradition, since unit's name originates from this religious term. This year is also 300 anniversary for our regiment being called Life Guard. So this date this year was celebrated properly: after visiting regimental church in St-Peterburg, unit drove to Gatchina and had reenactmrnt there. Along with other units representing Russian Guards, we participated in manuevres in the countryside and won the decisive battle over French Young Guards. After the action, a feast was organized to celebrate the holyday. See our report (in Russian). Russia. This time fortune was on French&allies' side. After glorious victory three months before, Russian troops were defeated in turn. Preobrazhensky regiment stood steadfast, opposing the outnumbering masses of the enemy, and moved back not faster than it was proper for Russian Guards. Russia. Reenacting an episode of Napoleon's Retreat from Russia in winter 1812. Reenactors performed a battle on snowy field of one of city's parks. Snow, ice and frost - good chance to test one's winter equipement and feel victorious over retreating Grand Army! Leningrad Region, Russia Reenacting the battle of Austerlitz in Russia. According to historical trustworthiness we were to fall back with heavy losses. Some photos from this action are available on "1812" . Czech Republic Austerlitz - Battle of three Emperors, re-created by European reenactors. Members of the unit participated in the events on this historical field. Read the report on the trip to Austerlitz. Leningrad Region, Russia Reenacting the battle of Austerlitz in Russia. Very impressing fight under snowfall. See videos from it. Kaluga Region, Russia The 186th anniversary of the battle of Maloyaroslavetz. Preobrazhensky guardsmen participated in a parade on town's streets, celebration ceremonies and the reenactment itself. The battle was hard and couple buildings were burnt like it was many years ago. Some photos from the event are available on our Gallery. Moscow Region, Russia Borodino -the most popular reenactment all over Russia and ex-USSR. It is held annually since 1989. See photos from the events in our Gallery, and on the "1812"